C-123 Providers starring in "Con Air"
"Con Air" is an action-filled movie starring Nicolas Cage. He finds himself trapped in a prisoner transport plane when the prisoners seize control of the aircraft. The film was released in 1997, but most of the filming was done in the second half of 1996. 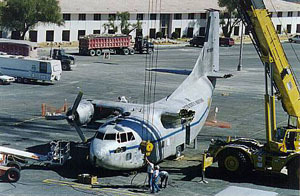 The part of the prisoner transport aircraft was played by several highly-detailed models at one-fifteenth scale, but also by three different real-life C-123 Providers. Which ones were they, and what happened to them? The true star of the movie: Ray Petkow's airworthy C-123K N709RR. Photographed by Graham Robson at Reno-Stead in October 1996. Click on the photo for a larger image. To me the real star of this movie was not Nicolas Cage, but Ray Petkow's C-123K Provider N709RR (ex 54-0709 msn 20158), which took care of all flying scenes. In the movie it retained its registration N709RR, and was painted with a thin blue cheatline and "United States Marshal" titles. It also received a bit of nose art, in the shape of a nice "Jailbird" logo. This aircraft was delivered to the USAF during the mid 1950's as a C-123B, and like most C-123s it was converted to a C-123K (fitted with underwing jet pods) in the mid or late 1960s. The Provider spent its last military flying days with the 302ndTAW. It was retired to MASDC at Davis-Monthan AFB, AZ on 4 November 1981, where it received inventory code CP064. For unknown reasons it was transferred to the US Navy on 21 August 1984, but it remained in storage at MASDC (now with inventory code 9C003). The US Navy transfer was probably nothing more than a paper exercise. On 11 April 1986 it was sold to Al Redick's Classics In Aviation (today named Aviation Classic) as N709RR, presumably via well-known aircraft broker Roy Reagan. Al Redick based his Provider at the Reno-Stead airfield in Nevada. In February 1994 the aircraft was taken over by Ray Petkow, but it remained in the care of Classics In Aviation at Reno-Stead. Perhaps former owner Al Redick did not want to lose sight of his precious Provider... Al is said to also have been closely involved in the flying operations for the Con Air movie. Although Ray no longer owns it now, N709RR is still airworthy today (2005). In December 2003 it was registered to Bill Michel's All West Freight Inc. (sometimes also spelled as Allwest Freight) of Delta Junction, AK. After having had Reno-Stead as its home for 17 years, it has now left there. Thanks to the help of Ruud Leeuw we know that it was ferried to All West Freight's private airfield (AK77) near Delta Junction, AK, where it arrived in the autumn of 2004. This will be the start of a new life for N709RR, hauling freight across Alaska (mainly for the many mining companies there). It's a good thing that this is not the real N709RR, but a stand-in. Here Provider N94DT is prepared for a dramatic crash into the lobby of the Sands Hotel in Las Vegas. Photo taken by Graham Robson in October 1996. Click on the photo for a larger image. Of course Ray Petkow's airworthy N709RR had to be handled with care and could obviously not be involved in any destructive scene. For such scenes, one or more stand-ins were needed. The final scene of the movie definitely required a stand-in: here the movie star crashes into the lobby of the famous Sands Hotel and Casino in Las Vegas. The Sands Hotel was the ideal location for such a crash scene, because it was about to be demolished anyway, to make room for the new Venetian Hotel and Casino. The film crew could just about do as they pleased with the hotel. For a long time it was uncertain which aircraft had been used for these scenes, but thanks to the work of Graham Robson we now know it was in fact C-123K N94DT (ex 54-0706 msn 20155). Of course, being a double of the movie star, it was painted exactly the same: registration N709RR, "United States Marshal" titles and logo, blue cheatline and "Jailbird" nose art were all copied in detail (which is what makes it so difficult sometimes to keep airframes starring in movies apart). Being only three airframes apart on the production line, this Provider was a very close relative of the movie star it stood in for. It may even have been delivered to the USAF on the same day. It too was converted to C-123K with its underwing jet pods. Its last days in the military were spent at 439thTAW, and on 19 April 1982 it arrived at MASDC for storage, with inventory code CP072. In October 1988 it was sold to Dave Tallichet (founder of the Military Aircraft Restoration Corp.), but the Provider was to remain in storage at Davis-Monthan AFB for many more years. On 24 November 1995 the aircraft was officially registered to them as N94DT, but since it was still in storage by that time, it is doubtful if this registration was ever actually painted on the aircraft. Graham photographed this aircraft extensively during 1995 and 1996, both at Davis-Monthan AFB where it had been stored all those years, and later also on the film set in Las Vegas. He is confident that the aircraft at Davis-Monthan and the one at Las Vegas are one and the same. In 1995, 54-0706/N94DT was stripped to bare metal and in August 1996 it was transported to Las Vegas. The outer wings had been cut off, possibly for easier transport. In Las Vegas it was mounted on a track, which would slam the aircraft into the front of the Sands Hotel. The aircraft was still bare metal at this time, noted as such in September 1996, and in early October it was painted in the United States Marshal colours with the registration N709RR. There are reports saying that N94DT left Davis-Monthan as early as July 1996, and that it went to the former USAF base at Wendover in Utah first, prior to being moved to the Las Vegas film set. However, this is unconfirmed, and a mix-up with stand-in #2 (see below) is likely. A different view of N94DT being readied at the Sands Hotel. Click on the photo for a sequence of three shots taken at the Sands Hotel film set. On October 21, 1996 this poor old Provider, now mounted on a old bus chassis, was launched along a specially constructed track into the front lobby of the Sands Hotel. Surprisingly, the aircraft survived this ordeal largely intact. 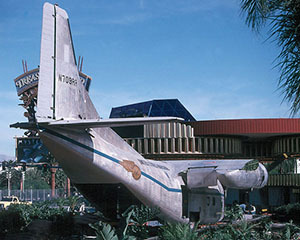 The nose section was destroyed when it impacted the hotel lobby, and the fin broke off when it got stuck under a structure in front of the hotel, but other than that it didn't sustain that much extra damage. You can click on the thumbnail on the left to see three photos, showing the Sands Hotel film set before and after the crash. After the filming was concluded, a large part of the Provider still remained fairly intact. Of course by now the aircraft was severely damaged, although a lot of this damage had already been done prior to the crash scene. The remains of N94DT were unceremoniously removed from the Sands Hotel site, and trucked away to the large scrapyards of the Aviation Warehouse in El Mirage near Adelanto, CA. It may still be there, or, since Aviation Warehouse's primary business is selling aircraft parts to the movie industry, bits and pieces of N94DT may have been used in other movies already. Who knows...? As a side note: A month after the filming of "Con Air", on 26 November 1996, the Sands Hotel and Casino was completely destroyed with explosives. This photo shows the most mysterious of the three Con Air Providers, carrying the fake reg N709RR. Which airframe is this? Photo taken at Wendover, UT on 16 May 2005 by Jeff Miller. Click on the photo for a larger image. A second stand-in was used for the filming of ground taxiing scenes at the former air force base at Wendover, Utah. It was equipped with a diesel engine in the nose and an old bus transmission, which enabled it to move without the use of its own radial engines. This stand-in proved to be the biggest mystery. It is still parked at Wendover today (2005), and although the cockpit has been completely ripped apart, it is still basically complete on the outside, with only the rudder and the props missing. Of course it too carries the now well-known United States Marshal colours, as well as the registration N709RR. This has led to much confusion, and many assumed this aircraft is the real N709RR. But the real one no longer carries the United States Marshal colours, and now has a "Large Marge" nose art. It was seen several times between 1997 and 2004 at various locations, in airworthy condition including props and rudder. So the aircraft at Wendover is obviously a different machine, but which one? This remained a mystery for many years. That changed when in June 2005 recent photos of this aircraft appeared at Airliners.Net, showing it still stored at Wendover, UT. There were also detailed shots of the modified cockpit and of the cabin. But the photos only showed the fake registration N709RR, and no clue as to its true identity. I contacted the photographer, Jeff Miller, and explained the problem to him. 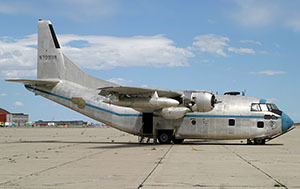 He was willing to go back to Wendover to try to find the data plate of the C-123, or some other means of identification. The following day I found a very nice photo in my mailbox: the data plate of the mystery Provider at Wendover, now no longer a mystery! The data plate of the Wendover stand-in. This photo by Jeff Miller, taken on 17 June 2005, shows the true identity of this airframe: msn 20245 ex 56-4361. Click on the photo for a larger image. 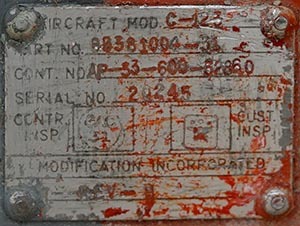 The plate was painted over, and Jeff had to scrape much of the paint off using a coin, but after that it clearly showed the manufacturer's serial number: 20245. This makes it ex 56-4361, also an ex 439thTAW C-123K. It's a few years younger than the other two C-123's, having been delivered to the USAF in 1957 or 1958. It was retired at Davis-Monthan AFB around the same time as the others, on 12 July 1982, with inventory code CP080. Apart from a transfer to the Department of State in 1994 (with a change of its inventory code to MC0003), nothing much else happened to it during its almost 14 years of storage there. But there were signs of a change, when on 14 January 1996 the Provider was transferred to the Property Management Branch (PMB) of the General Services Administration (GSA) in San Francisco, CA. The GSA is a governmental agency which - among many other tasks - disposes of U.S. war surplus goods, including aircraft. Such transfers are often a prelude to a sale, as it was in this case. 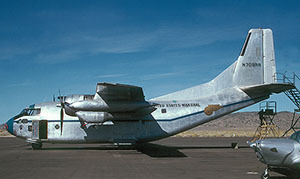 A short while later the aircraft was painted in the now well-known United States Marshal "Jailbird" colours, including "N709RR" on the fin, and it was moved to Wendover, UT for the filming of the movie's ground sequences. The filming took place during the first two weeks of July 1996, after which the aircraft was donated to the Historic Wendover Airfield Foundation. It's good to see that this aircraft still survives today. Hopefully it will be there for many more years to come, instead of being sold to some shabby scrap dealer. Many thanks to Graham Robson and Jeff Miller for their invaluable help in solving these issues, and for the use of their photos. Thanks also to Ruud Leeuw for the info on the current whereabouts of the real N709RR.